Digital adoption has been the bedrock of enterprise growth strategy in recent years, with the objective of optimizing processes, reducing cost, and delivering better customers experience, eventually culminating into accelerated revenue growth. However, enterprises are realizing the need for a transformational approach to digital adoption, rather than investing in incremental developments. Our research of 150+ digital engagements indicates that about 30% of the digital initiatives now have a centrally driven transformation objective to reimagine processes, improve the business models, and redefine customer journeys. For realization of this objective, design-led approach and impactful innovation is increasingly becoming a key customer imperative. Collaborative innovation to achieve tangible outcomes is being expected by enterprises and progressively becoming the differentiating factor for service providers. Service providers, having made a slew of design-focused investments in the past need to step up to deliver quantified and measurable business impact for the customers. 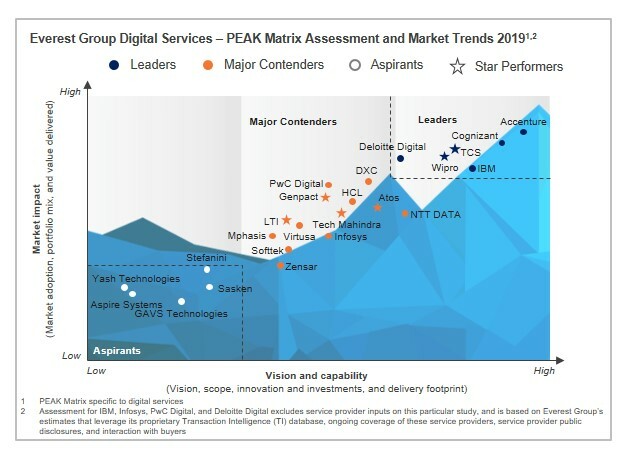 In this research, we present an assessment and detailed profiles of 24 digital service providers featured on the digital services PEAK Matrix™. Each service provider profile provides a comprehensive picture of its service focus, key Intellectual Property (IP) / solutions, domain investments, as well as two case studies. Through our interaction with over 45 digital heads / CIOs of we have also consolidated the best design and innovation practices for service providers and enterprises need to follow in this report.